All in good condition complete with manuals. Here the emphasis is placed squarely on the all-female trio of adventurers who make up the player's role-playing team. Title: Final Fantasy X-2. Bookmark Us. United Kingdom. Final Fantasy 7 Dirge of Cerberus (small tears in cellophane) - PS2 UK Sealed! Small tears in outer cellophane (see photos). Remains fully sealed with official Sony tear strip. Official UK Release. All have manuals except FF X. Discs have wear/marks but should play fine. Might need a clean. FINAL FANTASY XII. FINAL FANTASY X (INCLUDES BONUS DVD). Kuri Kuri Mix (manual missing). - Final Fantasy X-2. EYETOY CHAT. EYETOY PLAY. STAR TREK : ENCOUNTERS . FINAL FANTASY X . STAR WARS : JEDI STARFIGHTER. Mint - The item looks like new (I'm reluctant to describe anything as mint). The Punisher: Disc VGC, Booklet VGC, Case VGC. Final Fantasy XII: Disc VGC, Booklet VGC, Case GC. Kingdom Hearts II: Disc VGC, Booklet VGC, Case VGC. Final Fantasy Dirge of Cerberus. Final Fantasy 10. Final Fantasy 10 - 2. Slight scratcher to disc plays no problem. 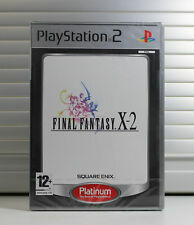 Following the exploits of the Summoner Yuna and her guardians as they battle an evil immortal enemy known as Sin, Final Fantasy X is the first title in the franchise to appear on the PlayStation 2. I AM A COLLECTOR. For 1 player aged 16 . Complete with case and manual - in very good condition. Disc has light scratches/marks. As war looms on the horizon, the mighty Archadian Empire begins a campaign to subjugate its neighbours. The small kingdom of Dalmasca shares their fate, and it is here that our tale begins. Two years after the fall of Dalmasca, the citizens are without guidance and direction. FINAL FANTASY XIII - FINAL FANTASY 13 - COLLECTORS POSTCARDS - SQUARE ENIX. Condition is Good. Dispatched with Royal Mail 2nd Class Large Letter. AS PICTURED ALL COMPLETE WITH BOOKLETS & IN ALL ROUND GOOD USED CONDITION. Join Tidus, a heroic blitzball superstar and Yuna, a courageous girl skilled in the ancient art of summoning, as they embark on an epic quest to defeat Spira's deadliest enemy. Includes Bonus DVD disc featuring interviews, trailers and more. Final Fantasy X. 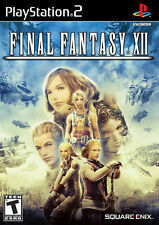 Final Fantasy XII. 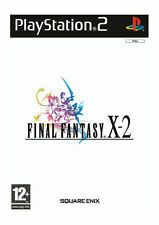 Item:Final Fantasy X & X-2. Long thought to have perished, the princess and Vaan team up with Vaan's friend Penelo, sky pirate Balthier and his partner Fran, and Basch, a captain from the Dalmascsan army who killed the king. The Gambit System lets players dole out instructions to individuals within the group. Title: Final Fantasy XI: Chains Of Promathia Publisher: Square Enix System: PlayStation2 Info: In the Great Crystal War, the forces of darkness were defeated. But they have regrouped and are now marching on the cities of Vanadiel. Complete in case with bonus DVD. Both discs are in excellent condition. Tested and working. AS PICTURED COMPLETE WITH BOOKLET & IN ALL ROUND VERY GOOD USED CONDITION. USED CONDITION. TESTED & WORKING. BOXED WITH MANUAL. 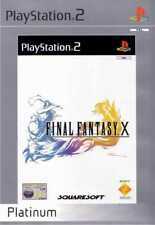 Final Fantasy X - X2 - XII - Sony PlayStation 2 PS2 plus Beyond FF Bonus DVD. Final Fantasy X complete with manual and bonus DVD - PAL Final Fantasy X-2 complete - PAL Final Fantasy XII complete with manual - NTSC Condition is Good. Dispatched with Royal Mail 2nd Class. Final Fantasy Vll Dirge Of Cerberus Sony PlayStation PS2 Black Label CIB Tested!